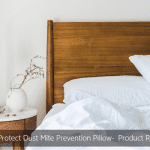 Looking for an affordable dust mite barrier cover for your mattress? Well, you’re in luck because today we’re reviewing the AllerProtect Allergen Barrier Covers. The AllerProtect allergen barrier covers are designed for mattresses, but they can also be used on doonas and pillows to any measurement. Specifically designed and manufactured anti dust mite zipper, stops dust mites entering via zipper feet and stitching holes and strong, taped seams, tailor invisible. The Allergy Cover itself is all ready to cover your whole mattress or pillow. On ALL SIDES! And a proven, consistent 4.5 micron pore size fabric. Smaller than dust mite faeces! You can start using it right out of the bag. It’s as simple as get a friend, unfold and cover your bedding – which is why I love covers like this so much. 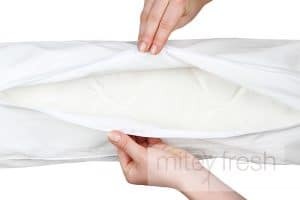 First, remove cover from bag, and spread out over mattress. Find the zipper end of the cover. With your friend, slip the foot end of the mattress to the floor and stand the mattress upright. Which can be easily achieved between the two of you depending on size of your mattress. Once the Cover is slipped on the head end top of mattress, slip the cover from top to bottom and let the cover slide down naturally. At this point, you can put the mattress back down onto the base and zip up the zipper, so it’s ready to put on your preferred bed sheets. It’s that easy. 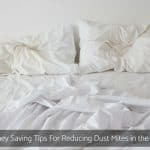 Reduce your exposure to house dust mites and their allergens by enclosing the entire mattress, the entire pillow and the entire doona with a dust mite proof zipper. 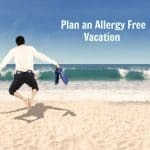 I’m just a huge fan of allergy covers and the AllerProtect brand specifically. Not only is the brand’s material 100% natural cotton, no dyes, no chemicals, no bleaches, the brand covers a 5 year manufacturer’s Guarantee – excuse the pun – potentially lasting up to 10 years. Maybe I’m biased as I created AllerProtect Pillow with Tony Parr and Mitey Fresh Australia. They’re so easy to use right out of the bag. And there’s no washing prior to use and wear needed. 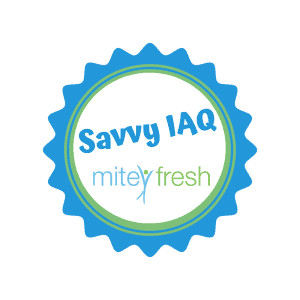 It’s one thing to say your product is natural and healthy, but another to back it up with third-party independent certifications that shows how Mitey Fresh is committed to providing transparency of our products and their manufacturing processes. After reviewing this quality anti dust mite allergen bedding covers, I’ve decided to give it my Savvy IAQ seal of approval. I highly recommend this 100% cotton product to anyone who is either tired of being unwell all night or looking a healthy alternative way to keep their mattress, pillow and doona clean. Again, it’s natural and reflects the values of Mitey Fresh, a business started from the pure necessity to remind ourselves we all can live natural and healthy lives without environmental hazards adversely affecting the health of us or our planet. Together we bring about healthy indoor environments and create rooms that provide calmness, healthy sleep, relaxation and restored energy for you and your family, create workplaces that provide ideal personnel attendance and elevated productivity. By returning indoor spaces to more natural conditions, we strengthen you and your family and your personnel’s mind, body and spirit. It’s nice that it also sustains our planet’s ecology, you’d agree. Vaughan, J., McLaughlin, T., Perzanowski, M. and Platts-Mills, T. (1999). Evaluation of materials used for bedding encasement: Effect of pore size in blocking cat and dust mite allergen. [online] Science Direct. Available at: https://www.sciencedirect.com/science/article/pii/S0091674999704951 [Accessed 10 Dec. 2018].